Donald Trump merchandise for sale at Trump Tower in New York City. Want to make fast money these days? Put the name Donald Trump on it. 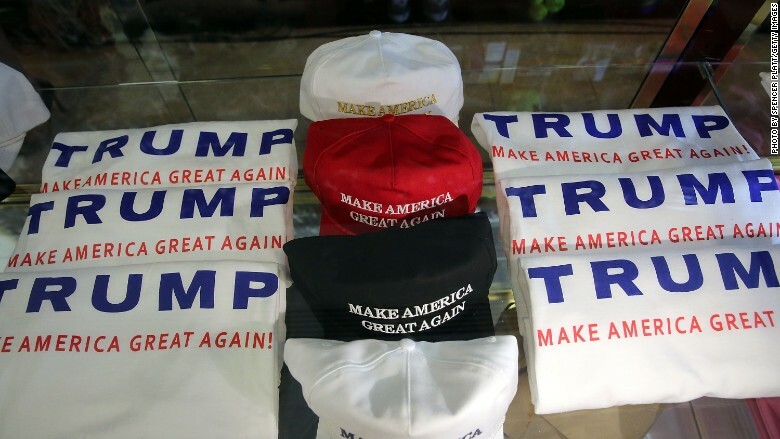 As Trump surges in the polls, people who sell T-shirts, hats and other items are riding the "Trump tide" to healthy profits. Just ask Jak, the owner of TeesDeals, a screen-printing shop in Atlanta. He has sold over 5,000 "Trump for president" T-shirts. "I think sales peaked last week," says Jak, who asked that his last name not to be used. "When the picture of Trump in the hat went on Twitter, we sold about 1,000 hats that day." TeesDeals sells a Navy men's "Trump for President 2016" shirt for $4.99 on Etsy, eBay (EBAY) and Amazon (AMZN). 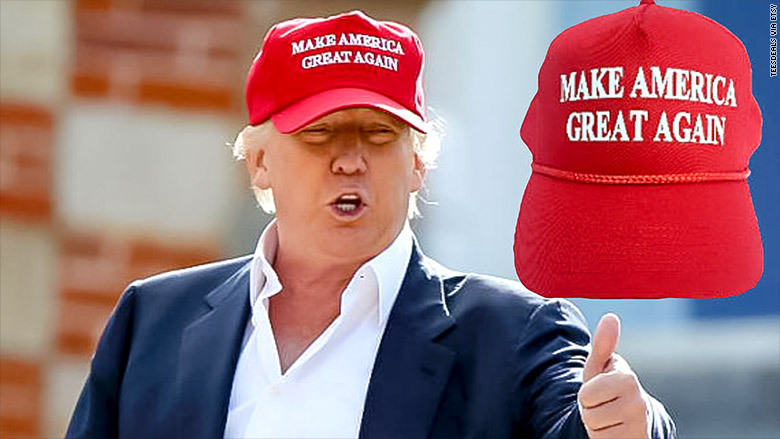 It also sells a red cap with Trump's "Make America Great Again" slogan for $5.99. Jak says he's not normally interested in politics, but he likes Trump and supports him. TeesDeals makes a "couple of dollars" in profit on the sale of each shirt or hat. Other sellers on eBay confirmed to CNNMoney that they are "absolutely" experiencing a surge in sales of Trump shirts and gear. A lot of people are jumping in now and one seller reported his sales slowed in September because of new competition. Trump has an official campaign shop set up, but prices tend to be higher than what you can find on eBay and Etsy. A standard men's shirt on the campaign site goes for $20. Hats are $25. But the "Trump tide" goes beyond clothes. Even a website that sells old stock and bond certificates to collectors is seeing a boost. Sales of anything with the name Trump have tripled in the past month, says Bob Kerstein, the owner of Scripophily.com. 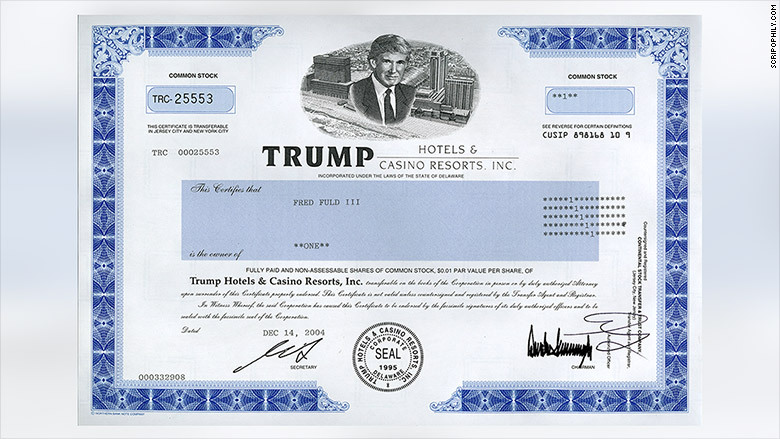 The site is selling stock certificates from Trump Hotels and Casino Resorts and Trump Entertainment Resorts Inc. for about $100 each. These companies are now bankrupt. But the certificates are from about a decade ago when Donald Trump was listed as chairman. "The Trump Hotels and Casino Resorts [certificate] is particularly collective because it has a picture of 'The Donald' on top," says Kerstein. In perhaps a telling sign, the certificates are now selling for more money as collectors' items than they were worth when the companies were alive. "He's the gift that keeps on giving," says Kerstein. "People weren't buying [Trump] certificates at all until he threw his hat in the ring."